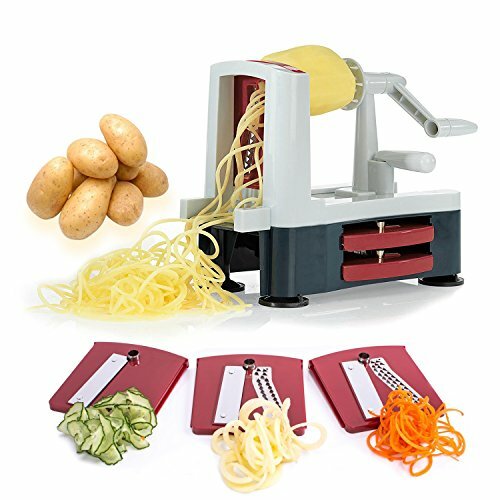 ✔ EASY TO USE: The slicer is an easy-to-use, handy tool that makes zucchini spaghetti, cucumber ribbon strands, curly fries or long, spiral apple strands; and there is frame for storing 2 blades, which will save the kitchen space for you. ✔ POWERFUL SUNCTION FEET: There are four power suction feet at the bottom of the machine which can sure that the spiral vegetable slicer on your counter tightly. Of course, you can remove it from your counter easily. ✔ THREE TYPES OF BLADES: Shredder blade (small holes), chipper blade (large holes), and straight blade. A storage compartment beneath the frame stores two blades and the third blade comes already in place. ✔ MATERIAL: The frame and blade plates of spiral vegetable slicer are made of high-quality, impact-resistant ABS plastic which is BPA-free and non-toxic. And the blades are made of durable stainless steel.